A snowplow makes its way down a side street in Dexter, Dec. 25, 2017. A fresh round of snow is heading into Maine later this week, and it could dump close to a foot of snow over most of the state in time for the Wednesday morning commute. The National Weather Service has placed most of Maine under a winter storm watch ahead of the storm, which is expected to start Tuesday night and last into Wednesday. This latest storm is forecast to dump 8 to 12 inches of snow over Greater Bangor, with similar amounts expected along the Down East coast to Eastport, according to the weather service office in Caribou. 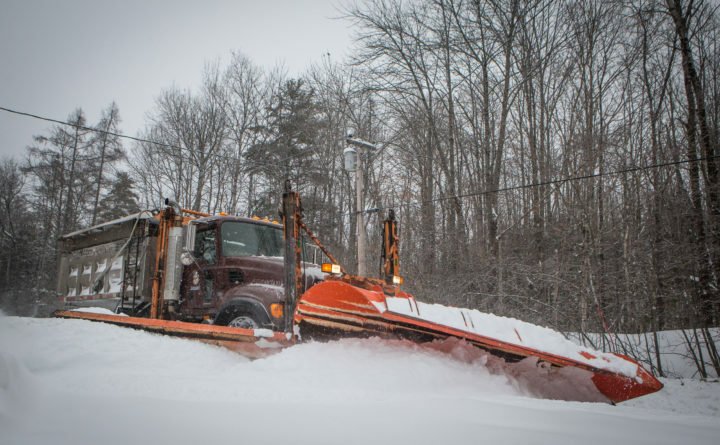 Moving inland, the predicted snowfall will be greater, with 12 to 18 inches in the forecast for a swath extending from Greenville in Piscataquis County, to Lincoln and Millinocket in Penobscot County, to Presque Isle and Caribou in Aroostook County, according to the weather service. Closer to the northern border with Canada that will begin to drop off, with about 8 to 12 inches expected to accumulate in Fort Kent, Madawaska and Van Buren, according to the weather service. Meanwhile, the weather service office in Gray is forecasting 8 to 12 inches to fall over much of the southern part of the state from Sanford in York County to Belfast in Waldo County. Inland toward Rangeley and Jackman the weather service is also predicting about 8 to 12 inches of snow to accumulate. Lighter amounts of snow are possible along the immediate coast from Portland to Rockland, where 6 to 8 inches is in the forecast. Along the coast that snow may change over to rain or mixed precipitation, which could reduce the amount of snow that accumulates, according to the weather service.